Although only three weeks have passed since I began my President’s Summer Fellowship project, I already feel as if I’ve made a lot of progress. My project kicked off June 11th, when I met with the Steering Committee of Architecture for Humanity Portland—a non-profit committed to providing local communities with accessible, sustainably minded design services—for an orientation to my summer internship. At the meeting, I sat down with three of the organization’s directors—Rachel, Nick, and Deana—to discuss my role within AFH and to establish a general outline of tasks for my position. As AFH’s new “Chapter Development Coordinator” it is my job to manage a variety of projects intended to extend the chapter’s mission, including projects related to client outreach, file management, and grant application. While I am excited to have so many projects to work on this summer—ones that will produce tangible, lasting results for my organization—it is daunting to have so much expected of me in such a short timeframe. In light of the range of tasks included in my summer outline, I realize that my position with AFH will be a learn-on-the-fly process. To live up to both the director’s and my own expectations for my fellowship project, I am channeling all of my energy into learning whatever skills or programs are necessary to succeed in my role as Chapter Development Coordinator. My first week on the job, I worked with Nick—AFH’s Outreach Director—to organize the chapter’s contacts and develop a Past Client Survey. I am pleased with my work so far: after collaborating with Nick, the other directors, and a few of AFH’s project leaders, the survey is just about ready to send out, and my Word formatting skills are greatly improved. Last week, I teamed up with Deana—the Director of Records—to tackle AFH Portland’s lack of a cohesive file management system. I synthesized file management advice from architectural firms and other non-profit organizations to create a new system for organizing projects into a uniform file structure and naming system. The process was tedious, but rewarding; I became familiar with the chapter’s past and current projects as well as the types of documents generated by the architectural process. Before taking a crack at AFH’s file organization system, I had never so much as attempted any form of large-scale file management. Now, I consider myself well versed. However, my work with AFH this summer is not limited to purely administrative tasks. I am happy to announce that, in addition to being the Chapter Development Coordinator, I am also Co-Project Manager for AFH’s new Village Gardens Project. 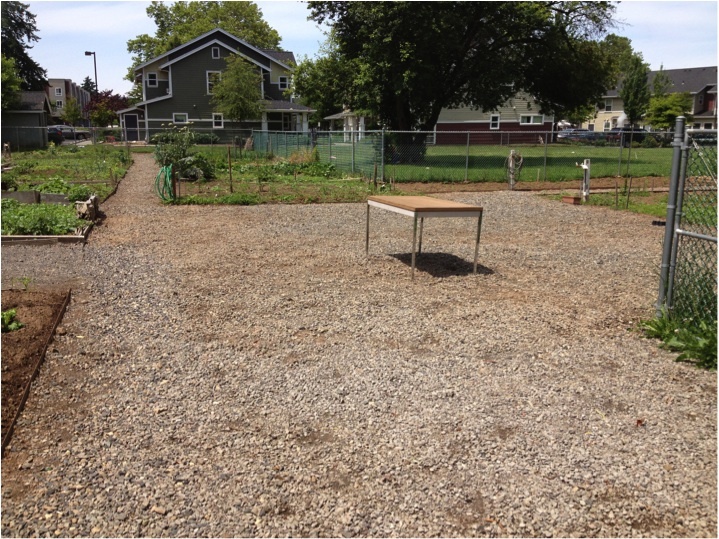 Managed by Janus Youth, another local non-profit, the project site is located at the Village Gardens community garden in a low-income housing area in North Portland. The project will fill the community’s need for an outdoor space to hold garden meetings and prepare communal meals that highlight the different cultures represented in the garden. Eager to get started, the Saturday before last I attended a work party at the North Portland Community Orchard adjacent to Village Gardens. 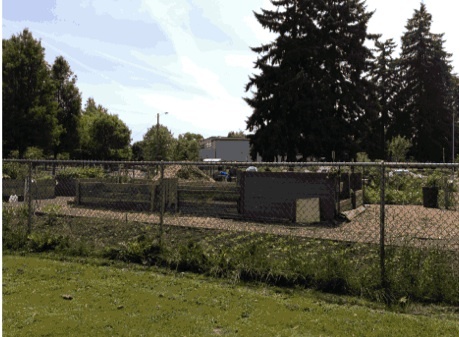 After pulling some weeds and learning about spring tree care, I got the chance to visit the Village Gardens site and meet a few community members. There, I learned that any structure that AFH designs must be impermanent, as per the garden’s lease agreement. Creating a space that will serve the community’s needs yet remain within the structural limitations of the project will be a challenge to say the least, but one I look forward to solving collaboratively. In addition, this week also marks the beginning of another component of my fellowship project, an Introduction to Architecture course at PSU. Though not as hands-on as my work with AFH and Village Gardens, this course will provide me with a foundational understanding of architectural practice that I can translate to my two roles with AFH. This week, the course covered the importance of communication in architecture, not only logistical communication between architect and client but also a deeper communication between a building itself and its surroundings, both physical and intangible. The lectures inspired me to consider how I can create such a relationship in my own project. The first step, I know, will be to cultivate a relationship with the community that my project aims to empower. That relationship begins this Saturday, at my first official meeting with the Village Gardens community. In the next few weeks, I hope to get to know this community—its needs, desires, and history—so that, together, we can create a space that will embody the values of Village Gardens as well as fill the need for a practical communal space. Although I feel a little in over my head, I know that if I keep pushing forward, my team and I can design a lasting and meaningful structure. Wish me luck!